Nevertheless, the press did not acknowledge this statement from the Lubitz press conference and continued to report falsely about the depressive copilot. We acknowledge how, given the fast pace of our times, many media often do not take the time to review and then update the truth of their content, which would introduce fresh insights that could lead to alternative viewpoints and, consequently, raise new questions. The FOCUS then asked: “Quarrel over alleged Lubitz lover: Was the “BILD” eagerly duped by an imposter?”(3) This example illustrates even more strikingly how sensational information goes unverified and is readily disseminated in order to increase circulation. One can begin to comprehend Ulrich Wickert’s statement that 80 percent of the reports about Andreas Lubitz were proven to be wrong! This entry was posted in All posts, General on 15. February 2019 by Autor. So it starts again! The driving force is once again the family lawyer Giemulla. Under the pressure of the statute of limitations, this reworked lawsuit has recently been filed. This information submitted to dpa would ensure a wide distribution in the media landscape. Is this the way to put to rest this tragic story? Why would one do something like this, and what does one want to achieve? Perhaps one wants to exert further pressure on Lufthansa in order to collect even greater compensation payments. One hopes for a bombshell story in the media which would increase this pressure on the airline, which may then be more willing to pay so that its name can again disappear from the negative headlines. From the words of attorney Giemulla one can see that it is a lawsuit brought by 200 relatives of 49 victims and demands more than double what was originally paid by Lufthansa. 200 relatives of 49 victims is an average of four relatives per victim! He argues that the suit is not only about money, but is also about clarification about where the airline failed. But it is difficult to believe that. Incidentally, the fact that the general public shares this disbelief is confirmed by the articles’ comments sections. Furthermore, the articles and comments were published only by regional newspapers or broadcasters – not by the leading media. Why would a lawyer employ such methods? Or in other words, is it Giemulla’s intention to constantly renew and sustain the image of the mentally ill copilot and, if so, why, and on whose behalf and in whose interest? Of course, he is also under pressure, because another attorney obtained larger payments for his clients on the condition that the charges against the Lufthansa Group were dropped. According to the cited STERN article: “Giemulla demands an inspection of the flight school records. He also wants to personally interview witnesses in the US in order to prove negligence. The overall concern of the bereaved was in addition to the monetary compensation, and that this would come through clarification. “At what point in the global corporation did the mentally ill copilot slip through the control network?” the lawyer asked”. And then there is the question: In the course of his work as a lawyer, is Giemulla entitled to demand access to files from the flight school or to hear witnesses? Is not that the job of prosecutors or judges? And this is quite apart from the fact that witness hearings were already carried out by the US authorities and are part of the investigation file. Should he be entitled to do so? If so, then he will hear nothing negative or distressing from anybody in the US. Regarding this we are absolutely confident, as no abnormalities or omissions would be found. The time in Arizona is the highlight of the training for all Lufthansa pilots. That’s what it was for our son. And Andreas was the first to finish this part of his training and with good results, without any special permission. Provided that Giemulla performed a thorough study of the files, he would have to be aware of these facts, but this is seriously doubtful in view of his false claims. If the public finally understood that the story of “the mentally ill copilot” was never true, then we would be left without a plausible explanation. And then victims, relatives, lawyers, the investigating authorities, the public, etc., would begin asking questions about the real cause of the crash and must then consider alternative scenarios. This entry was posted in All posts, Bogus press reports, False investigation results, incomplete investigations on 16. January 2019 by Autor. Why were the voice recordings of the cockpit voice recorder not clearly assigned? As in every Airbus A320, various microphones were installed in the cockpit of the crashed Germanwings plane and these recorded the audible activity on the cockpit voice recorder (CVR). Each microphone is assigned to a separate track on the CVR with a recording time of 30 minutes. The various microphones record the verbal communication of the pilots in addition to any kind of noise in the cockpit. These sounds include, for example, alarms in the cockpit, adjustments to the control knobs (as far as they are acoustically perceptible), repositioning of the pilots’ seats, the closing and opening of the cockpit door, etc. Even with acoustic recording of the opening and closing the cockpit door, it cannot be proven beyond a reasonable doubt that someone indeed exits or enters. This would only be possible with video recordings, which do not exist. On page HA 05111 of the French Investigative File (German translation) the following assignment of the microphones and recorded tracks were documented during the playback of the CVR on March 26, 2015 by gendarmes of the Air Traffic Gendarmerie SRTA Paris-Charles-De-Gaulle: “Tracks 1 and 2 correspond to the headsets of the captain and the copilot.” From this it can be concluded that track 1 is assigned to the captain and track 2 to the copilot. To prove beyond doubt and to ensure that the copilot, Andreas Lubitz, and the captain, Patrick Sondenheimer, were actually present in the cockpit during the last 30 minutes, a voice identification should have been carried out. For this, one would have a close relative (for example the co-pilot’s parents and the captain’s wife) listen to the CVR playback. Andreas Lubitz had a normal male voice. The statement that he had a weak voice is purely speculative and unproven. All these requests were rejected with absurd and unreasonable explanations. This entry was posted in All posts, False investigation results, incomplete investigations on 30. November 2018 by Autor. Various press reports have claimed that there was an intentional lockout. This has led to the assumption that immediately after the captain left the cockpit Andreas locked the door. Over and over again pictures of the cockpit door locking system switch were commented on together with pictures of the UNLOCK-NORM-LOCK cockpit panel. Media websites displayed A320 locking system animations, always with the claim that Andreas had set the switch to «LOCK». Approximately four minutes later, at 09:34:31, a ringtone was recorded for one second. This sound indicates that someone outside the cockpit is requesting access. This is also evident from the BEA final report on page 13 and is consistent with the cockpit voice recorder transcript recordings (see excerpt below from the investigation file). However, the recording of the ringtone access request proves that Andreas had not deliberately locked the cockpit door. This is because if he had deliberately set the toggle switch to the LOCK position the entire cockpit door electronics, including the keypad and audible ringtones, would automatically have been deactivated for a period of 5 to 20 minutes, depending on the airline. Thus, no ringtone would have sounded and no ringtone could have been recorded. However, the fact that the ringtone was recorded is clear from the BEA final report. This clearly refutes the claim that by deliberately locking the cockpit door Andreas prevented the captain from entering! The assumption stated in the report and also by the public prosecutor, Brice Robin, on 26.03.2015 that Andreas Lubitz did »deliberately prevent the opening of the door« in order to deny access to the captain cannot be proven and is therefore purely speculative and was, in regards to the public statement, hastily stated by the prosecutor, Brice Robin. Therefore, this assumption mentioned by Brice Robin is not based on any facts or evidence in the report. This entry was posted in All posts, False investigation results, incomplete investigations on 17. August 2018 by Autor. Why did this matter receive no attention? A few days after the crash the public prosecutor assured us that the investigation would continue in all directions. Already during the preliminary investigation, the pro-government / pro-industry press published information found among Andreas Lubitz’s seized documents: a life-support document signed by him on 23.03.2015. 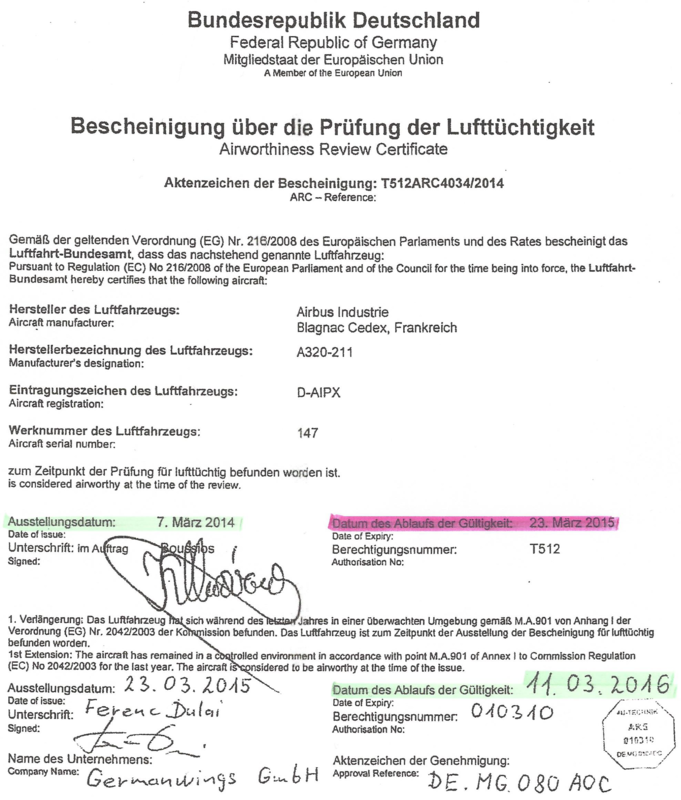 Another document that was signed the same day (23.03.2015) was given little or no attention by either the investigators or the media (understandably): Namely, the Airworthiness Review Certificate. For a commercial aircraft to operate safely and properly, it requires valid certification. The document that confirms it is in proper condition and performs safe flight operations is called an Airworthiness Review Certificate. According to the investigation file, the Airworthiness Review Certificate for the aircraft (D-AIPX) dated March 23, 2015, had expired – one day before the crash. • Under the current Regulation (EC) No 216/2008, an Airworthiness Review Certificate is valid for a maximum of one year. • The previous certificate had been issued on 07.03.2014 and appears to be valid until 23.03.2015, i.e. until the day before the accident, so more than a year. • There are certain special conditions for certification extension. However, such an extension is unusual – here, 16 days – and, strangely, at the time of the document’s issue in 2014. • Apparently, the certification document with the LBA authorization number T512 was typed by the aircraft examiner, allegedly a Mr. or a Mrs. “Boussios”. However, the signature under this name does not match. 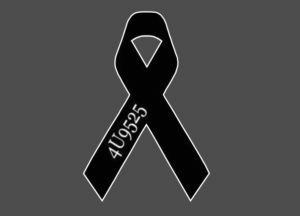 • According to the document, the certification took place on the day before the accident and was signed by Ferenc Dulai for Germanwings GmbH. The subsequent certification was to have been 11.03.2016 – 11 days before the allowable one-year expiration. The curious 16-day extension beyond the one-year deadline was thus almost “compensated” for by the shortened time span before the next certification on 11.03.2016. Investigations in all directions? Clearly not. This entry was posted in All posts, False investigation results, General on 27. May 2018 by Autor. The third anniversary and Easter have passed. We have taken a longer break than usual, which has allowed us to mourn in peace – for the first time together as a family. For the first time ever it was possible to give room to our grief. In recent weeks, we have had many conversations with people known to us as well as with those unknown, which have done us good and given us strength. We also talked a lot about the past, the current situation and the so far unexplained. So in this way we have found our way back to our website, especially because a few points have emerged which we would like to discuss in more detail. In the meantime, we have updated the expert report, which is now available in its entirety on this website. With our contribution today, we would like offer our perceptions of the press conference last year, at which parts of the expert report were presented. From today’s point of view, it would not really have mattered if others topics – perhaps even more relevant – had been presented. We do not know what expectations the journalists who came to the conference had. At any rate, our intention was not to present an alternative crash scenario or to “whitewash” Andreas – given the amount of “dirt” thrown at him as well as the Lubitz family, it would have been impossible. After the many lies, falsehoods and false interpretations of the last two years we wanted to provide all media representatives with the same information at the same time, to correct these untruths and, further, to prevent future distortions. In the two years prior to the press conference, reporters, journalists, editors (however they called themselves) were constantly pursuing us for “information.” But what lay behind their promises? Immediately after sending the invitations to the media, when nothing had yet been published about the forthcoming press conference, we received an email from BILD reporter Mike Passmann in which he asked us to answer two questions before 5:15 pm that same day: namely, why we had chosen the date of the second anniversary and whether we had considered that this particular date might insult the sensibilities of the families of the 149 victims. To repeat, Passmann’s email was sent at 3:00 pm of the same day, requesting a reply by 5:15 pm. Even if one had read the message immediately after receiving it, there would be little time to formulate a thoughtful answer, particularly if we could not answer with a simple “Yes”, “No”, or “Maybe”. This limited timeframe makes clear that Passmann did not really expect an answer and could later write that the Lubitz family “refused” to reply. Moreover, because the impractical deadline passed, as it was expected to do, it was obvious that Passmann could then turn to the relatives and their lawyers, some of whom are always willing to talk. Prior to the press conference, when not a single word had yet been spoken, Passmann approached the victims’ lawyer, Giemulla, and asked him to speculate about the probable content of the upcoming conference. Giemulla cheerfully suggested that the expert, van Beveren, would speak of toxic fume events, his favorite topic and hobbyhorse, which would be irrelevant to the issue. In the end, the date was secondary, but ideally suited to evoke a negative mood on an emotional level, with high media sales guaranteed. It may be that the press once again attempted to encourage conflict between victims’ relatives and the Lubitz family. We might ask why journalists didn’t simply boycott the press conference in protest against its insensitivity? Non-attendance at the conference would have been their ethical stance. At the live press conference itself the mood was hostile, an impression felt not only by those present but by innumerable television viewers as well. Some suggested that the clicks of the cameras were something akin to a firing squad. Preregistration was required because there were many more interested people than the venue could accommodate. Not everything went smoothly and not everything was presented as professionally as had been planned, but not because of time limitations. For Ms Herrnkind, a STERN reporter, the most important question was how much the expert (van Beveren) was paid. This clearly demonstrated her lack of interest in the critical content of the press conference, but rather how illdisposed to us she was, and is. Before the press conference, Ms Herrnkind had written to our lawyer requesting an exclusive interview with STERN. She questioned why we had previously corresponded with “Welt am Sonntag”, a newspaper that would reach only conservative readers and suggested that we should grant STERN an interview as the victims’ relatives had done. Further, she wondered whether the Lubitzes were aware that the STERN is among the largest magazines in Europe. With them we would be in very good hands. Hypocrisy! The question should not really be how much we paid the expert, but rather how much she, or whoever, paid for a very personal computer file created in 2009 which Andreas had created as a booklet about experiencing and overcoming his depressive episode and which he dedicated to those close to him. This was something never intended for public dissemination. Furthermore, Ms Herrnkind selectively lifted lines and phrases in order to draw a connection from 2009 to 2015 and published this invention in the STERN – quite brazen and tasteless. And, last but not least, a TV report from RTL that was broadcast on “EXTRA” on 27.03.2017 should not go unmentioned. On the program, aviation expert Ralf Benkö claimed that he had closely analysed Mr van Beveren’s 800-page expert report but could not arrive at any new theory as to why the plane had crashed. Firstly, the complete report covers far more than 800 pages (see expert report with the appendices). And secondly, at the time of the broadcast the report’s contents were known only to Mr van Beveren himself and to us. One sequence showed Benkö leafing not through the van Beveren report, but rather – clearly recognizable – through the German version of the BEA final report. Long live investigative journalism and truth! It is unfortunate that the echo of the Lubitz family’s passage to the public has died away so quickly. Some clue or piece of information from the press conference should have been worth a closer look or inquiry in appropriate places – by the authorities or the government. It is understandable that they were unable to comment immediately on the day of the press conference, but they instead immediately offered denial of the findings. Maybe the reactions and non-reactions surrounding the press conference should be set aside for a while. This entry was posted in All posts, Bogus press reports on 7. May 2018 by Autor. There are so many things for me to see. We were allowed to spend together. How much joy you have brought to me. If your grief helps you, so grieve. And then grief gives way to faith. We must only separate for a while. Therefore, hold on to the memories in your heart. And welcome you to your new home. At our home on March 24, 2018, as in the years before, 150 candles will be burning. This entry was posted in All posts, General on 23. March 2018 by Autor.